TASMANIA'S return to the AFL's leading under-18 competition will coincide with a name change – the NAB League to replace the long-standing TAC Cup. The fresh revamp comes after the TAC had partnered the competition since its inception in 1992. SONS OF GUNS 2019 bloodline prospects: Who's eligible for your club? The Tasmania Devils will join permanently, with the NAB League to welcome five northern state squads for an Academy series ahead of the NAB AFL Under 18 Championships. The competition is set to have a stronger emphasis on education, wellbeing, high performance and coaching with a key focus centred around preparing non-drafted players for their future endeavours. "NAB has been a fantastic supporter of our AFL talent pathways for 18 years now and it is exciting that they will extend their support and be naming rights partner for this new era," AFL head of talent pathways and State League competitions Tristan Salter said. "Over 1000 AFL and AFLW players, including the likes of Dustin Martin, Chloe Molloy, Gary Ablett jnr and Madison Prespakis, have been drafted from Victoria's under 18 competitions – with 2018 producing more than 50 percent of the boys (62%) and girls (59%) talent at the NAB AFL and AFLW Drafts. "We welcome Tasmania to the competition in what will be the start of the team's journey towards a return to the VFL competition." As flagged by AFL.com.au, the new look will also see a NAB League App created in mid-March and hosted by Telstra, offering football fans highlights, news and the latest statistical data. "The dedicated NAB League App will provide our audience with live information at their fingertips, from stats to game vision and match highlights," Salter said. "The increased digital access to the competition and its players will help our audience learn more about our draft prospects across the entire season, not just around draft time." Melbourne star Clayton Oliver, the winner of the Morrish Medal in 2015 for the competition's best and fairest, highlighted the importance of the league for his draft rise. Having missed out on selection for Vic Country in the NAB Under 18 National Championships, Oliver's impressive second half of the season for Murray Bushrangers saw him selected by the Demons at pick four in the NAB AFL Draft. "I wasn't doing too much with my footy at the start, I was mucking around and just playing footy," Oliver told AFL.com.au. "It got to halfway through the year and missing out on the Championships drove me, I went out there in the last 10 games, played alright and was lucky enough to win the Morrish Medal. Sports marketing business TLA Australia has been engaged to commercialise the new NAB League. 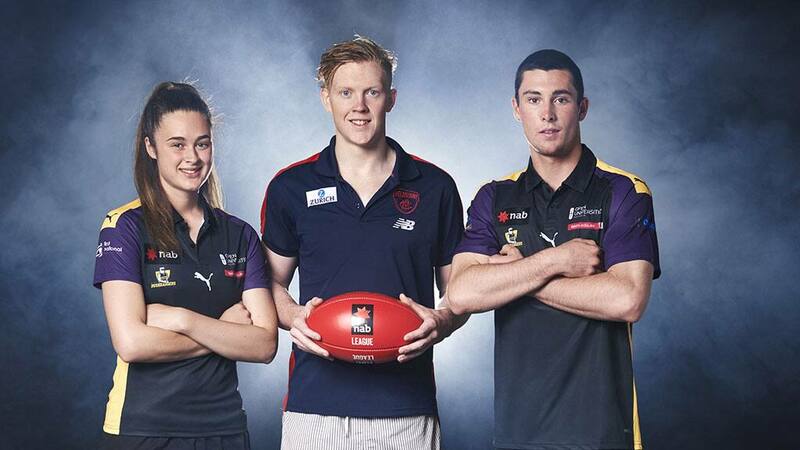 The NAB League girl's competition begins on March 2 while the boys will start on March 23.